Kettlebells provide a dynamic, engaging and tough workout. This Kbell poster has been designed by Productive Fitness for beginners. The exercises will work your whole body, but especially the chest, back and legs. This brilliant full-color 24″x 36″ laminated poster by Productive Fitness Publishing demonstrates 12 exercises to keep you fit. Follow the poster’s easy instructions to perform everything from the dead lift to the swing and the squat. Continue your routine with lunges, side press, figure 8’s, bent-over row, clean lift, Russian twist and half get up. Protection of the spine during exercise is important, which is why all Productive Fitness posters teach how to attain and maintain proper torso stabilization. Easy step-by-step instructions make this kettlebell poster a workout must. Contact us if you would like the paper version. 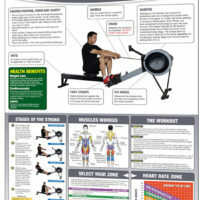 Beginners will find this poster a great addition to their workout routine.